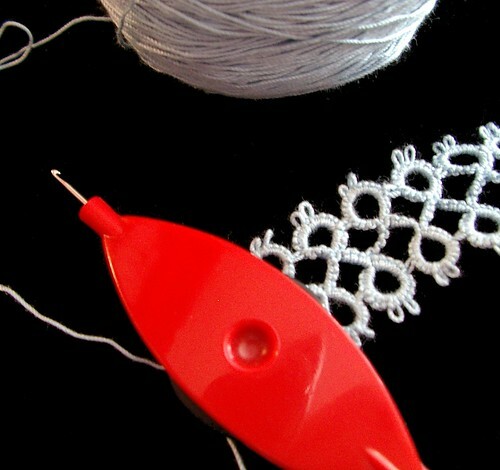 My oldest daughter (12 yrs old) over the 4th of July weekend decided she wanted to pick up tatting. So I sat down to teach her. Not an easy feet since I smashed my left hand with a hammer last week making a sampler book (more about that at a later date). I tried and she succeeded at it. So this is her second piece of tatting the first one she accidentally left at grandma's on the 3rd when we all celebrated the 4th of July. I know sounds odd the 3rd is not the 4th but the 4th was Sunday and we don't do things like that on Sunday even our Easter egg hunts happen on Saturdays. She was not half bad for a beginner give her time and she will do great. I told her she had to make this until she runs out of this thread I always do that to them. By the time they finish with 1 or 2 balls of thread they are usually pretty good at what ever skill is involved. What a great job she did! I'm so glad you posted it.